Blog for all craft beer lovers, ratings and reviews. APPEARANCE: Pours a fresh pot of dark roasted coffee black. Hitting the glass it almost look as if a black hole is forming in the center, leaving some wonderful dancing hues of brown to fill in the edges. Produced a billowy head of two fingers in height, before quickly dissipating into a nice brown egg shell colored halo. AROMA: Smells like I just walked into a back country breakfast diner! The inviting aroma of maple syrup freshly being poured over pancakes comes rushing towards you. Deep dark chocolate muffins, a fresh pot of coffee. The coffee smells like when you are tossing the filter out and have nothing but the spent coffee grounds. I’m trying to get bacon, but its not coming out on the bouquet. 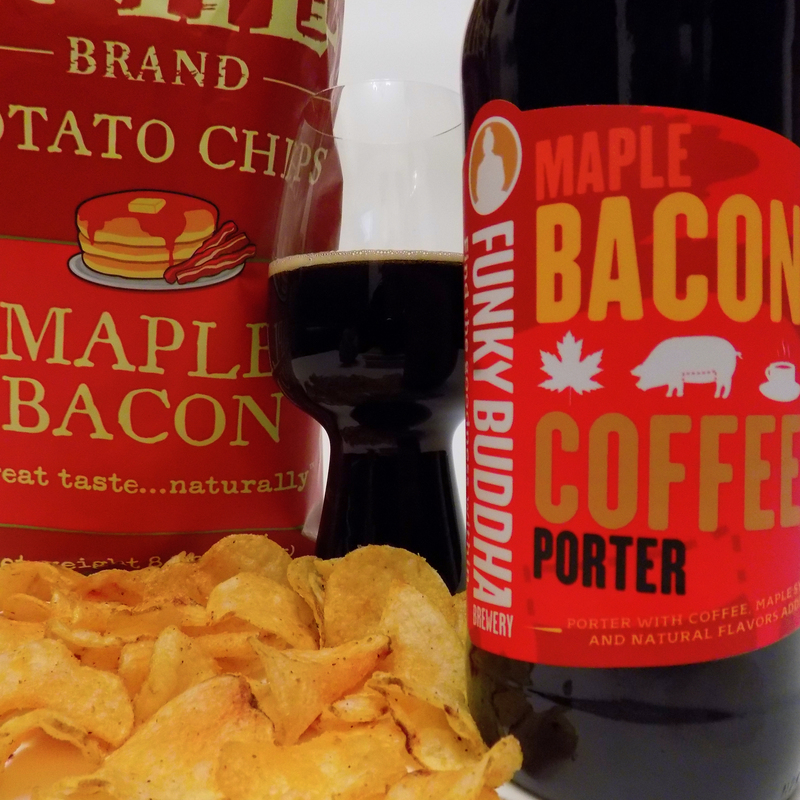 A slight smokiness that i could assume would be the bacon but the delicious maple syrup and coffee keep crashing in to my nostrils and wipe away any faint aromas of that. TASTE: Boom! I am now Violet Beauregarde but instead of chewing my meal via gum I am drinking it through this beer. Liquid breakfast, maple is the dominate flavor. I can taste in being poured right into my mouth. The sweetness of the maple gives a nice introduction to the the slight bitterness from all the coffee swirling around. The coffee and mid palate maltiness really brings a harmonious balance to the beer. Right as i am thinking i have tasted it all the burnt crispy bacon flavors come rolling in to play. Not smokey which I am happy for, but more of a savory flavor that reminds you of bacon without feeling like you just drank a piece. The layers all blend together very well, a slight cocoa powder dusting floating on top of a coca-cola is present on the end. Really interesting and delicious tasting beer. MOUTHFEEL: Right on the cusp of being a medium body but hits just bellow. The carbonation is lazy and lovely just the way I like my porters to be. Slight oiliness and slickness that goes well with knowing it has maple and bacon flavors within it. The beer expands while in the mouth giving it a marshmallow fluff creaminess that is very nice. Super drinkable, so much so that I am glad i was selfish and had this all to myself! OVERALL: I can only assume that someones job at Funky is to pour bottles of maple syrup into bottles all day long while this is being made. How else could they get so much immense, rich, sweet goodness into each of these bottles. I thought this was truly an amazing porter, the flavors where amazing and layered well within each other. The only flavor that really didn’t pop was the bacon, but i think that’s what makes this drink so easily. The highlight of this Porter is the aroma, one of the best i have experienced on a beer in a while. I know the actual base porter itself takes a backseat to the additions of the adjuncts, but that’s what this beer is all about. I for one think it was done outstanding! This entry was posted in Beer Reviews, Stouts/Porters and tagged #beer, #beergeek, #beerme, #beernerd, #beerporn, #beerreview, #beerzombies, #craftbeer, #craftbeerlover, #dtlv, #lasvegas, #lv, #porter, #sincity, #zombie, #zombies, bacon, buddha, chocolate covered cherries jubilee, coffee, coffee grounds, delicious maple syrup, funky, Funky Buddha, malt profile, maple, maple syrup, roasted coffee black, Violet Beauregarde by beerzombies1. Bookmark the permalink.